Not only can you continuously improve year-over-year performance, but you can also adjust to combat a negative economy, minimize Cost-Per-Sale, maximize revenue, and set media ROI targets year-over-year, and much more. Establish a quantitatively grounded approach to media & tactic effectiveness measurement to enable management of feeder market ROI, maximize website traffic and reservations, and increase loyalty program participation. Marketing Mix Optimization & Reservations Forecasting Platform, Marketing Mix Manager® online reporting, optimization, and media planning support. Quantify impact of a multi-media marketing mix on policy sales volumes in the property & casualty insurance industry. Media / Tactics included DRTV, Online, Direct Mail & Shared Mailers. Consumer Confidence is a strong leading indicator of consumer response. Negative impacts of declining consumer confidence can be partially mediated by effective and efficient media planning and strategy. Optimizing the marketing mix with the same budget increased policy sales by 7% and decreased cost-per-sale (CPS) by 6%. A decrease of 7% in budgets can maintain current sales volumes. In a signal that media still works even in down economies, almost 1/3 (32%) of the policy sales at risk due to soft economic conditions were “won back” by media. Accuracy of 3-month forecast outlook averaged 1.6% error per month. Quantify impact of a multi-media marketing mix on sales volumes, determine optimal budget allocations by medium, and understand implications for Cost-Per-Sales at varying overall ad budget levels. Overall, all medium and tactic (direct mail, online, in-store point-of-purchase, street teams, newspapers, and magazines) were dramatically underfunded. Additional analysis revealed that the optimum CPS would be generated at 3X current budget levels. Due to the low budget and the demonstrated effectiveness of the media / tactics, even 9X current budget levels would still generate a lower CPS than current budget levels. Model forecasts quarterly sales with less than 3% error. The customer experience during a service encounter is a fundamental aspect of your relationship with your customer and a key determinant of the value proposition. Many times, the way in which a service issue is handled is more important than the occurrence of the issue in the first place. Optimizing call center service quality to maximize the positive impact of a service encounter significantly increases customer loyalty and decreases churn. Optimize customer care service quality to maximize customer satisfaction with the service encounter in tech, billing, retention, and security transactions and thereby minimize customer churn. Quality to Marketing Management System (QTMMS) linking optimized service quality with customer satisfaction and retention results. Platform supported with optimization software & monthly quality-control reporting. 4-5% average bsolute churn forecasting accuracy. Understand who your customers are, what they like and dislike, and how to communicate with them most effectively. A meaningful customer segmentation is the first and most crucial step toward customizing communications across your customer base. Customized messaging can increase response rates by as much as 25%. Client needed an actionable customer segmentation to customize direct response messaging to its customers and to guide creative development for mass media executions (proven to increase sales rates as much as 25%). Develop attitudinal segmentation based on client survey data. Develop discriminant function-based mapping model / mechanism to map (transfer) the segmentation beyond the survey sample to the company’s entire customer database based on 3rd party appended demographic data. 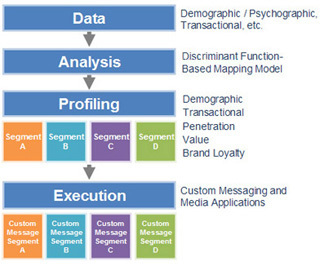 Segmentation produced four (4) actionable customer segments. Mapping model generated segment flags for 100% of the 2.5 MM customers in the company’s database. Our direct response target models can help you significantly increase the performance of your online and offline direct response campaigns. 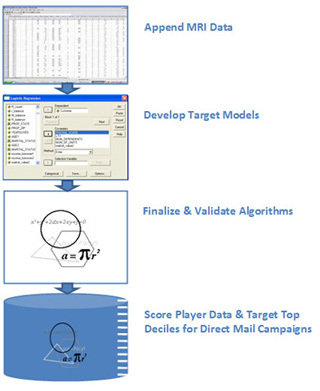 Coupled with our learning plan and continuous improvement processes, target modeling is a “must” component of effective direct response campaign management. Target new customers for financial services based on MRI syndicated survey data. Develop a discrete choice model predicting likelihood of customer opening the type of financial services accounts being marketed. A survey question measuring the desired behavior was used as the dependent variable. Survey demographics were recoded to mirror the values of 3rd party demographics which were used to map the model response probabilities to the client database. Target model produced 8% response rate vs. 0.5% for a control group. Our forecasting performance is among the strongest in the industry. These selected forecasting case studies demonstrate the forecasting accuracy of our marketing mix models across multiple industries based on weekly, monthly, and quarterly data. Our forecasting system are ideal for year-over-year target setting and tracking YTD performance towards those targets. Quantify impact of a multi-media marketing mix on product sales of a high-end technology product launch. By analyzing historical product launches, we determined that 3 of the 4 media (online and offline) measured were historically under-funded; i.e. spending was below the threshold required to achieve critical mass and measurably impact revenue. The 4th media was over-funded; i.e. spending exceeded the economic optimum beyond which each additional dollar spent generated a diminishing return. In order to maximize future product launches Polaris recommended re-allocating dollars from the 4th media to incrementally fund all other media. Specific allocations were determined based on the individual elasticities for each media as well as operational constraints unique to our client. As a result of our analysis and subsequent optimization, products launched after the MMMO platform was established produced a 10% increase in sales for the same budget dollars and the platform is now in its second year of operation. Quantify impact of a multi-media marketing mix on reservations. By analyzing historical media plans and reservations, we determined that 1 of the 6 media measured was historically under-funded; i.e. spending was below the threshold required to achieve critical mass and measurably impact revenue. Another was over-funded; i.e. spending exceeded the economic optimum beyond which each additional dollar spent generated a diminishing return. The other 4 were funded in excess of the critical mass threshold but at or under the economic optimum; however, in one case the contribution to number of reservations booked was minimal. In order to maximize future product launches Polaris recommended eliminating two of the media measured and re-allocating dollars for the remaining 4 based on their individual elasticities. By optimizing the marketing mix our client realized an 18% increase in reservations for the same budget dollars and the platform is now nearing the end of its first year of operation. Quantify the impact and return of various media, a major sports sponsorship (World Cup), and consumer value perceptions (based on tracker survey results) on sales and revenue. Media (predominantly mass) drove 33% of ad sales and paid back $1.20 / $1.00 in a very low margin category. Increasing weekly Gross Ratings Points from 50 to 70 increased sales by 28%. Re-allocating 10% of the general market mass advertising dollars to high performing diversity markets decreased corporate cost-per-sale by 8%. The World Cup sponsorship generated a 17% lift in sales during the promotional period. The consumer value perceptions (based on quality / price survey data) generated 43% of total sales highlighting the significant contribution of consumer perception and valuation to the consumer purchase process. Customer Retention Management System – CRMS. Supported by volumetric forecasting platform with internal performance measures, customer service survey results, and brand loyalty results as inputs to forecast customer churn rates. CRMS tested twice in-market (six-months apart) after rollout. Approximately 1% forecast error over entire out-of-sample period (approximate average absolute weekly error = 5%). Platform supports client retention reporting. System enabled a 10% decrease in customer churn year-over-year. Develop meaningful survey-based customer value segmentation approach to enable two-year value scoring of customer database and lead targeting. Series of five discriminant function models accurately predict volume of purchase and 2-year value of prospects / leads across multiple products. Models used to regularly score customer database and target prospects “in the market” for new products. Profiles of five value segments (low value to high value) successfully leveraged for messaging in direct response media. Determine impact of seven-month major brand campaign (1,000% increase in average monthly brand spend) on the company’s value proposition (i.e., quality / price relationship from the customers’ perspective). Major brand campaign drives an 8% increase in perceived value of the company’s products and services (based on tracker survey) and generated a 2.8% increase in market share. Determine impact of basic and advanced training on compensable customer satisfaction and loyalty survey results at the store / unit level. Pooled time-series linkage of training to a Customer Loyalty Index (CLI) at the store / unit level. Basic training significantly improves the customer experience resulting in higher CLI’s at the store / unit level. Each base training module completed increases the CLI by 0.11%. Advanced training had no impact on customer loyalty, due predominantly to lack of structure of the advanced modules, leading to a reorganization of the advanced curriculum. Accurately represent the customer experience from service contact through to completion and develop metrics appropriate for the administration of employee variable compensation programs. Customer Satisfaction Indices (CSI’s) based on structural equations and indexing techniques supported with weekly reporting. Final CSI models reflecting the customer experience from report to completion immediately rolled into client compensation programs and are in 6th year of use. CSI’s track syndicated research and accurately reflect industry positioning throughout the year. Establish a metric to measure and manage employee satisfaction, commitment, and retention suitable as a compensation element in leadership variable compensation programs. Employee Satisfaction Index (ESI) based on structural equations and indexing techniques supported with weekly reporting. Final ESI models reflect 13 organizational dimensions critical to the satisfaction, success, and retention of employees (e.g., job equity, role clarity, pay, culture, tools, leadership, communication, etc.). Results immediately rolled into client’s leadership variable compensation programs and are in 2nd year of use. Increase employee retention throughout a call-center organization through effective management of key drivers of attrition. Employee Retention Management System (ERMS) linking measures such as employee satisfaction, center performance, pay / incentives, leadership, etc., to employee attrition and optimizing performance to minimize attrition. Employee attrition decreased 20% in test centers preceding corporate rollout. Quantify the impact of employee retention on customer retention to evaluate ROI of employee retention programs and initiatives. Pooled time-series linkage of employee satisfaction metrics, attrition, and customer satisfaction results to customer retention at the service center level. 10% decrease in employee attrition results and more than 20k retained customers annually.